Just under two years ago authorities in the United States busted one of the most important movie piracy release groups on the planet. In recent months its members have been handed some of the harshest copyright-related sentences on record but immediately after the raids something interesting happened. Instead of running for cover, pirates regrouped and the piracy situation actually got worse. At the turn of the decade, one piracy release group was making its mark on the Internet like no other in recent times. After releasing countless movies and even opening their own BitTorrent tracker, predictably the IMAGiNE group was soon on the radars of Hollywood and U.S. authorities. In September 2011 IMAGiNE was dismantled when its U.S-based members were rounded up and arrested. In the months that followed IMAGiNE members were brought to justice and handed some of the harshest copyright infringement sentences on record. Lower ranking members of the group received 23 months in prison but a sysop, cammer and group leader were hit with jail sentences of 40, 48 and 60 months respectively, the latter being the longest sentence ever in a case of this type. One of the witnesses to be heard in the IMAGiNE case was Toronto-based anti-piracy group Deluxe. They were hired by the studios to spy on group members and produce an intelligence report on their activities. A copy obtained by TorrentFreak reveals some interesting facts. Deluxe lists IMAGiNE’s strengths as being able to get a movie online shortly after its theatrical release, ability to provide consistently high audio captures, maintaining a high volume of releases, and their connections to international suppliers. IMAGiNE are said to have been responsible for 41% of all English language movie audio piracy from September 2009 until they were busted in 2011, five times the amount of their closest competitor. The group used a total of 15 video sources between September 2009 and September 2010, and a further 39 between then and the group’s demise in September 2011. Deluxe obtain some of their evidence by analyzing forensic codes embedded into video and audio of new movies. They note that IMAGiNE successfully removed the codes from seven movie releases including Fast Five and X-Men:First Class. However, Deluxe were able to trace many back to the theater in which they were originally recorded, as the chart below shows. Interestingly, IMAGiNE themselves were also victims to piracy. Deluxe report that for some pirated movies released online by other groups, every audio track could be traced back to IMAGiNE. Over a single year period IMAGiNE were responsible for 54% of all English language audio tracks examined by Deluxe. Of course, the raids had an immediate impact. 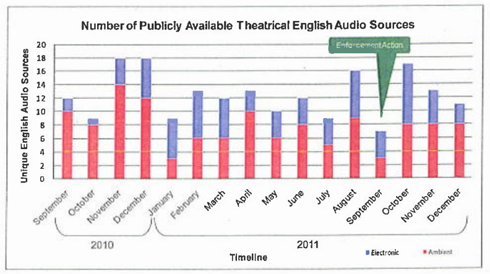 “The enforcement actions occurred in early September 2011, and there was a decrease of unique pirated English audio sources this month. 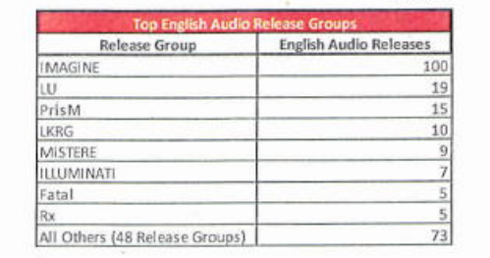 In fact, September 2011 had the lowest amount of English-language piracy instances in the entire dataset,” Deluxe report. But the downturn didn’t last. “However, in the following month, the amount of new English audio sources shot up dramatically, with more English-language release than each of the nine months prior to the enforcement actions. Electronic audio, which is typically higher quality (and more difficult to obtain) continued to be captured and released,” Deluxe reveal. “The data implies that the enforcement action towards IMAGiNE impacted the volume of English language audio piracy strongly in September, and other release groups increased their activity in response to IMAGiNE’s departure,” Deluxe add. The anti-piracy group further notes that audio piracy in December 2011 was down on the same month in the previous year but there was still a high volume of pirated releases in the months following IMAGiNE’s demise. But there was more bad news when Deluxe examined piracy latency – the number of days between a movie being released and subsequently being pirated online. 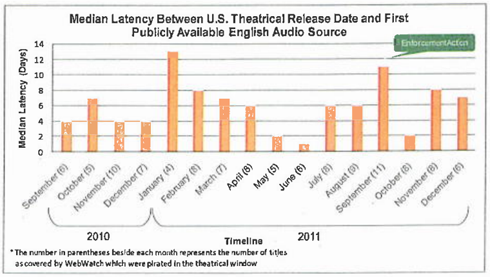 “The latency period during September 2011, the month of enforcement actions, increased substantially. During the following three months, there was another significant change, with the latency period decreasing substantially. “This implies that the piracy community re-oriented itself following IMAGiNE’s departure. English language audio was, on average, available online sooner after the theatrical release date than was previously normal when IMAGiNE was active,” Deluxe note. While the information produced by Deluxe suggests that busting IMAGiNE yielded only short-term success, the report only goes as far as December 2011 and therefore omits the important period starting January 2012 when everything had settled down. We shall have to wait for further information to become available to assess the long term impact the IMAGiNE busts had on movie piracy and whether or not it was worth all the effort.